Michael Batnick, Director of Research at Ritholtz Wealth Management, and blogger of the always interesting Irrelevant Investor, recently shared the historical performance of U.S. stocks when they fall below their 200-day moving average, something that occurred early last week (bold mine, quotes Michael's). The average 30-day return going back to 1960 is 0.88%. The average 30-day return when stocks are below the 200-day is -2.60%. That’s 13.8% annualized for all periods and 18.4% for periods below the 200-day. While there is nothing magical about the 200-day moving average, I am a huge fan of momentum because it tends to result in improved risk-adjusted returns using any number of rolling periods (i.e. 100-day, 200-day, 300-day) and due to momentum's ability to cushion my own behavioral issues (I have a very difficult time doing nothing... something that can cause a material impact on my investment performance if not controlled). For me, momentum provides a systematic approach to protect my portfolio from myself. To keep myself busy (again... I have a very difficult time doing nothing), I have done quite a bit of work on momentum, specifically thinking about ways that may further enhance its outcomes. In this post I'll discuss one area I've looked into, which (in U.S. equity markets) happens to be sending a conflicting signal relative to the 200-day moving average. 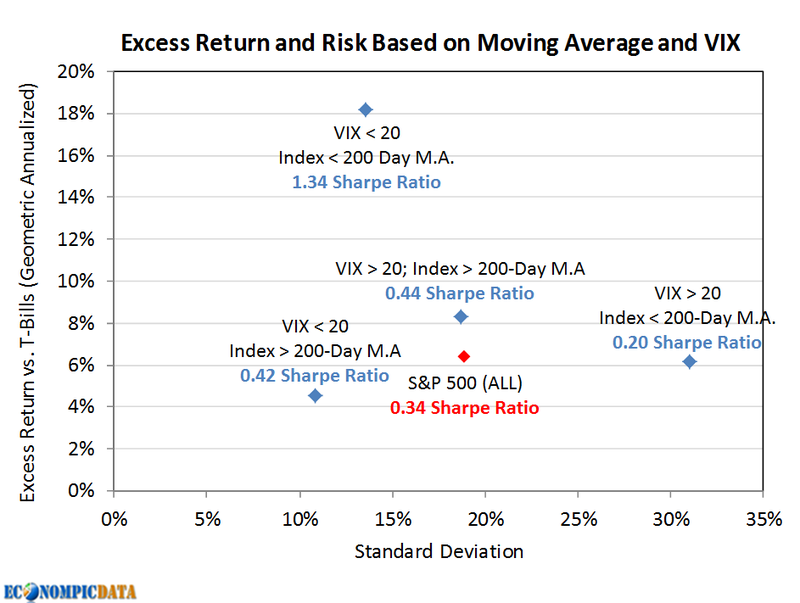 In a recent post, I outline the relationship between market volatility, the VIX, and future returns (see The Case for a Steady Volatility-State Managed Portfolio for high level details). The takeaway is there is valuable information contained within the VIX, specifically that it does a pretty good job of predicting future levels of volatility (due to the relationship between historical volatility and future volatility), which in itself has a strong relationship with future risk-adjusted returns (when volatility is high, risk-adjusted returns tend to be lower). As the chart outlines below, there is a strong relationship between momentum and implied market volatility; when momentum is strong (i.e. stocks are above their 200-day moving average), the VIX is below 20 seventy percent of the time and when momentum is weak (i.e. 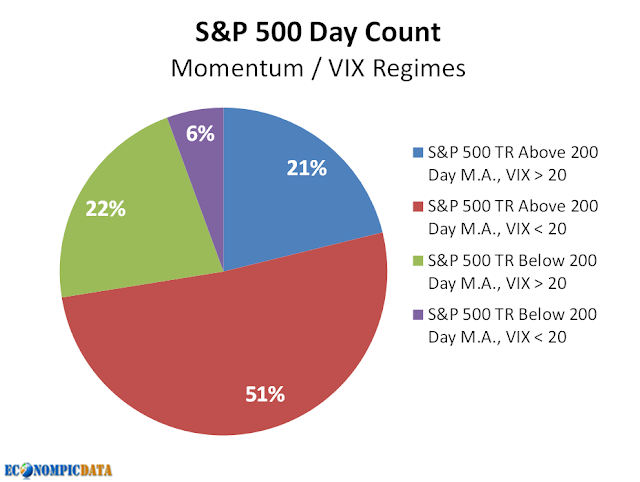 stocks are below their 200-day moving average), the VIX is greater than 20 eighty percent of the time. Of note (and what we'll focus on below), is when the market is below its 200-day while the VIX is less than 20 (a rarity at only 6% of the time). Similar to what Michael pointed out in his analysis going back to the 1960's, when stocks are below their 200-day moving average, market risk is materially higher (28.4% annualized standard deviation vs. 18.9% for all days since 1993) and the Sharpe ratio is lower. BUT, in those 6% of days that stocks were below their 200-day moving average, while the VIX was below 20, not only was market volatility lower (13.6% standard deviation vs. the 18.9% for all days), excess returns to t-bills were materially higher (18.2% annualized vs. 6.4% for all periods), resulting in a Sharpe ratio 4x higher than the entire period. Which brings us to the current period... despite all the noise currently in the market (China, Greece, my own personal nightmare of having my rent recently doubled), as I write this post the VIX is sitting below 17.5, well below the 20 threshold outlined above. Perhaps the VIX is providing investors with a signal that the market will bounce (mean reversion) vs. providing verification that the market is in a continued downtrend (momentum). In other words, a market that has recently underperformed, yet remains "calm", may in fact be a good buying opportunity.